Well, it's finally here. This 2CD package was definitely worth the wait, even that two of the featured bands (Solaris and Spock's Beard) have already released their entire Progfest performances on CD, and one band that played at the event (Pendragon) isn't even featured herein (the story is that the sound was so distorted that the tapes couldn't be salvaged — see this writer's Progfest writeup in issue #9 about Pendragon and people running from the theater with their ears covered...) At any rate, the remaining six bands (in case it's been so long that you forgot, they were Ars Nova, White Willow, Deus Ex Machina, and Landberk, as well as the aforementioned two) are all featured herein. The sound quality is nothing short of outstanding, due in part to the engineering efforts of the late Kevin Gilbert, to whom this package is dedicated. Especially noteworthy are the live performances by Ars Nova, Deus Ex Machina (yes, you can really hear the keyboards now! ), and Landberk — all of whom sound better now in the final mix than they did in the original live setting. The playing order of the bands on the discs is altered slightly from their original live playing order, with Spocks and Landberk sandwiched between the bands that played on day one. As usual, Musea has done an excellent job on the packaging. In all, this collection definitely captures the spirit of the event, while smoothing some of the rough edges. 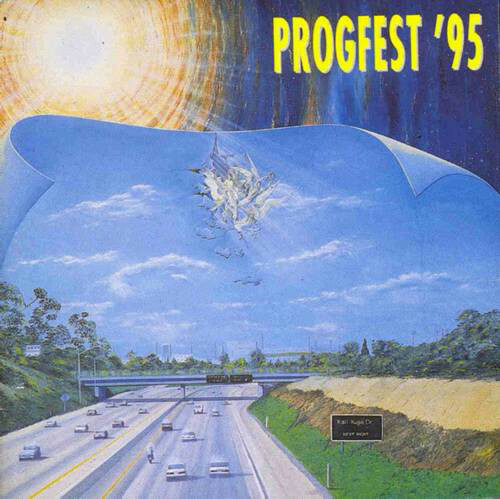 For those of you not able to attend the festival in Los Angeles in November 1995, here is your chance to experience the highlights of Progfest ‘95. Opening the festival and this 2CD set is Ars Nova, a female Japanese trio of keyboards, bass, and drums. Progfest was their debut performance in the US and their three crowd-pleasing instrumentals "Morgan," "Jihad," and "Danse Macabre" clearly demonstrate their Goblin influenced music of hard-driving, dark keyboard progressive rock. Next we have three Landberk songs: "Kontiki," "Dream Dance," and "Time." This Swedish band’s music has a dark edge to it very much like Joy Division and Fra Lippi Lippo. Musea rounds out the first disk with four songs from the Italian band Deus Ex Machina: "Exordium," "Respublica II," "Ad Montem," and "Si Tu Bene..." Deus Ex Machina is a six-piece band consisting of drums, bass, guitar, strings, keyboards, and vocals. Their music also has a hard edge to it mixed with driving rock, jazz, and chamber elements. Disc 2 opens with two songs by Norway’s folk-rock phenomenon band White Willow: "Lord of Night" and "Cryptomenysis." Sara Trondel’s angelic voice propels the band through these 17 minutes of excellent music. Next we have one song by, at the time, the relatively unknown US band Spock’s Beard. "The Light" is 16 minutes of fairly raucous 70s-styled prog rock that intermittently mellows out, reminding me of Wind and Wuthering era Genesis. Then closing this set are four songs by the Hungarian band Solaris: "Apocalypse," "Oz," "Hungarian Danse," and "Solaris." Solaris reformed especially for this festival after not having performed together in over five years. The results are not disappointing. Solaris play a folk influenced symphonic rock that was both the highlight of the festival and this 2CD set. Musea has done a wonderful service by capturing in crystal clear detail Progfest ‘95. If like me, you have not had the pleasure of attending the festival nor hearing these bands this set is an excellent introduction to their music.